› InstitutsangabenUniversité Paris 13, Sorbonne Paris Cité, Centre National de la Recherche Scientifique (CNRS), Ministère de l’Enseignement Supérieur et de la Recherche (MESR), and GDR Phosphore (CNRS) are gratefully acknowledged for financial support. A general synthetic procedure was developed for H-α-hydroxyphosphinates via Abramov reaction. The present work is a complementary study to those reported till now. This methodology has the advantage that it can be applied to various aliphatic and (hetero)aromatic substrates. 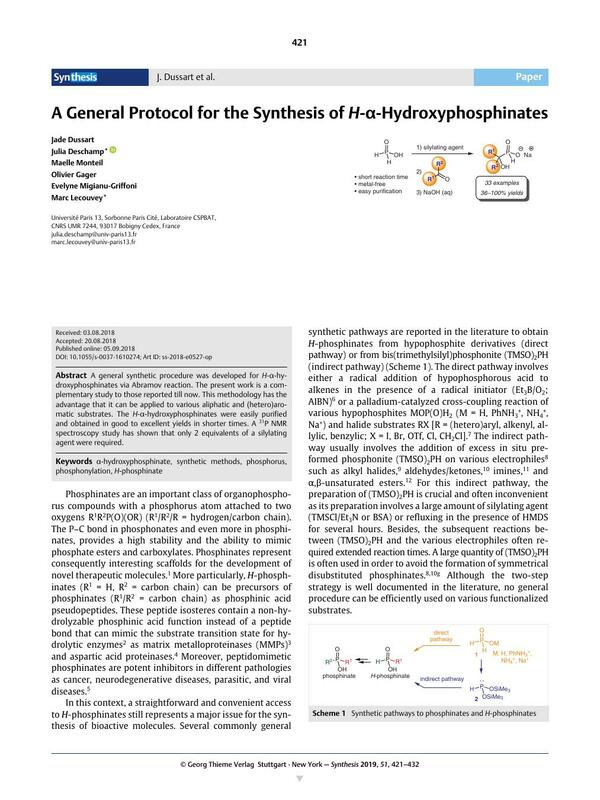 The H-α-hydroxyphosphinates were easily purified and obtained in good to excellent yields in shorter times. A 31P NMR spectroscopy study has shown that only 2 equivalents of a silylating agent were required. Supporting information for this article is available online at https://doi.org/10.1055/s-0037-1610274.